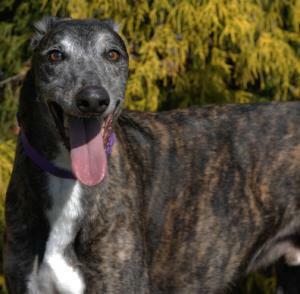 Fargo is a very tall, gorgeous guy with a beautiful, shiny, dark brindle coat. He is an extra large guy, one of the tallest we have seen. Because he has a more tall and narrow build, he probably weighs somewhere in the upper 80s instead of in the 90s like a stockier boy his size would. Fargo is not tattooed and never raced we think he may be an AKC bred greyhound rather than a racing bred greyhound. He was acquired by his first owner as a puppy. He has lived in a home as a pet all his life. His first owner had a serious health condition that prevented him from caring for his dogs anymore and relinquished Fargo in 2012. He was quickly re-adopted but now it has happened again. His current owner also has some serious health problems that is forcing her to return her 3 greyhounds to us Fargo, Lucy and Angel. She loves these dogs very much, but just can no longer care for them due to her rapidly declining health. Fargo is very outgoing and loves everyone he meets. He will give free kisses to everyone. He loves to snuggle and will quickly make himself at home beside you on a bed or couch and is likely to try to get in your lap. Don't plan on napping alone if Fargo is around. He is a happy, silly guy with ton of personality and no one would ever guess that he is an older guy if he didn't have a little gray on his face. He likes to play and run. He is a guy that will be up for any type of activity because he still has quite a bit of energy. He is the typical couch potato though, going for short bursts, then sleeping for hours. Fargo is very smart and curious and opened a crate door, walked inside picked up a dog bowl and carried it out of the crate to hopefully have it filled the first morning in his foster home. He is a fun, entertaining guy that makes his foster home laugh. He seems to adjust well to anything and has shown no anxiety after being moved into foster care. He is just so happy and loves everyone and everything so we think he would make a fantastic therapy dog or meet and greet dog. He will certainly get a lot of attention being the biggest dog in the room and the one with the sweetest, most outgoing personality. Fargo is wonderful with kids. The only flaw we have found with him is that he is afraid of thunderstorms and fireworks. He crates well but isn't always perfectly quiet so may not be an apartment dog. Fargo was seen by our vet and had a dental and has a clean bill of health and is ready to go home. Fargo passed his cat and small dog tests so should be able to live with either. He lived in a home with a number of other dogs of different breeds both males and females so should be very good with other dogs. This is a super sweet guy!! Because Fargo is a senior, he qualifies for our reduced senior adoption fee of $200.